Taylor Roofs is a proud family business run by Managing Director, Jamie Taylor. Our ethos is to provide high quality roofing workmanship, coupled with old fashioned values and client respect. This, we believe, is what sets us apart from our competitors, and is the ‘driven brand’ that all of our roofers work tirelessly towards. We have a large team of experienced roofers with a combined experience of over 35 years in the roofing industry. Our strive for customer satisfaction is led by Jamie, who has an absolute passion for roofing and an unrivalled commitment to 100% customer delight in every job that is undertaken. 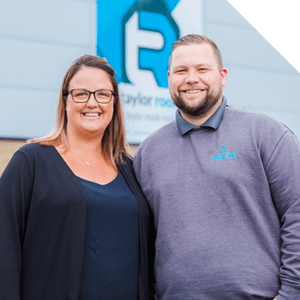 With Jamie at the helm of the roofing contracts, the office is managed by Jamie’s wife, Kelly, who shares in the company passion, and ensures the same level of commitment is delivered from the moment you contact us. We offer you a hassle free roofing and roofline service where we will meet you at your convenience, provide you with a detailed photographic roof report, ensuring you have a complete understanding of what work needs to be done. All of this backed up with guarantees to provide you with total peace of mind. We continually focus on the quality of training provided for our roofers, ensuring that all minimum certifications are in place from day one, with a planned training programme going forward, ensuring that our entire team are at the pinnacle of roofing technology, methodology and workmanship. We’d love to work with you on your roofing project – please don’t hesitate to speak with one of our team.